DuPont, the famous chemical company, was actually built on gunpowder.1 Founded in the early 1800s, DuPont was a small family concern until the early 1900s, when Pierre DuPont modernized and organized the company around functions: primarily sales and manufacturing. The structure served DuPont well, particularly in World War I, when in response to overwhelming demand DuPont vertically integrated its supply chain, and grew to become one of the largest companies in the world. And thus, the divisional structure was borne. It returned DuPont to profitability, and remains the model for nearly every corporation of significant size, except, notably, for Apple. 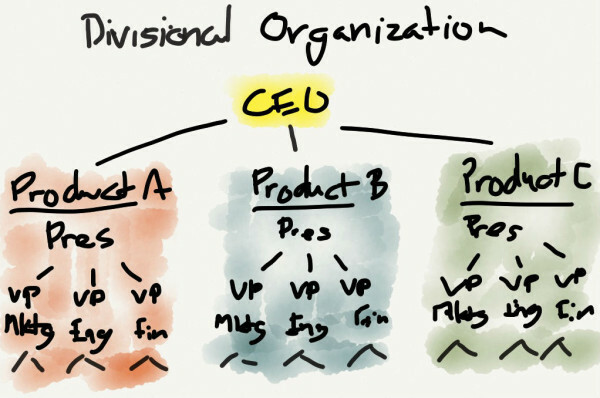 The differences between a functional and divisional organization are simple, but profound. A divisional organization is organized by product. In a divisional organization, different products are companies unto themselves. They have their own marketing, their own engineering,2 and their own finance. There may be some centralized functions, such as legal and HR, but everything that makes money for a product lives within that product’s organization. Most crucially, each product has its own profit-and-loss statement (P&L). The performance of each division is thus clear to everyone from the CEO to the division presidents to Wall Street, and accountability is usually directly tied to the P&L. So is motivation: senior division leaders have much of their income tied to the performance of their division. This model scales to a very high number of products. Consider General Electric, the classic example of a divisional company. It has twenty-five different businesses, ranging from finance to jet turbines. The competitive advantage of such companies is usually in their management acumen and capital reserves, and the preferred employee is a generalist, able to quickly master any job with a refined set of skills. A functional organization is organized by function. Products are matrixed. Functional organizations are the exact opposite: each function is siloed, and products cut across functions in a matrix-like fashion. This significantly expands the role of the CEO and his leadership team in all products, as that is the main point of coordination. In this model, there is usually no ownership for a product’s P&L. Instead, everything accrues to the company’s all-up P&L, including compensation. In addition, the ideal employee is a specialist, not a generalist. Most functional organizations are single-product companies; to put it another way, almost all companies start as functional organizations. In fact, the moment a company switches to divisions is as good a marking point as any for the end of startup-hood. Apple is the exception that proves the rule; they are functionally organized, but that absolutely does not mean a functional organization is best. 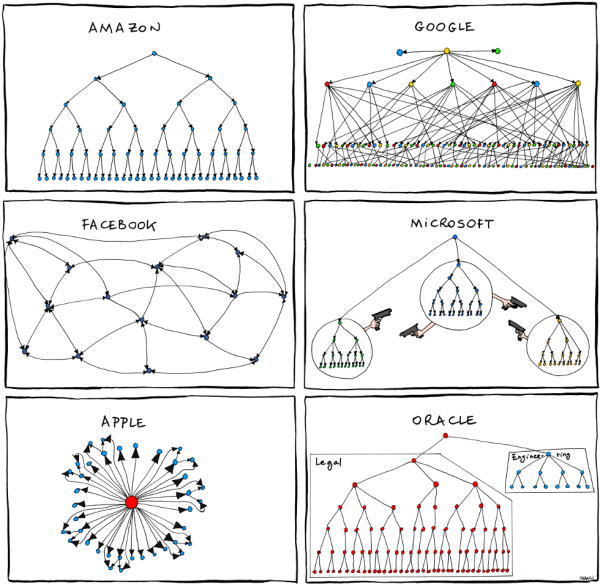 Understanding why almost all corporations are organized by divisions (and how Apple manages a functional organization) illustrates why I think Ballmer is making a grave mistake. Microsoft has 13 distinct products and services with a run-rate of more than one billion dollars a year: Windows, Office, Xbox, SQL Server, System Center, Unified Communications, SharePoint, Developer Tools, Dynamics (ERP & CRM), Online display and search advertising, and Azure. First off, that’s incredibly impressive and is one of Ballmer’s greatest accomplishments. Second, look again at that list. There are certainly commonalities; for example, all of the products are built on software, just like DuPont, where gun powder and paint were both based on nitrocellulose. But the markets for Xbox and SharePoint, say, are totally different, again, just like they were for gunpowder and paint. Multiple products in a functional organization are a recipe for a complete disconnect between functions, and Ballmer is putting at significant risk his greatest legacy: Microsoft’s diversification. Smaller, yet growing divisions will be hurt by this change. Apple is the counterexample here; a central tenet of management’s thinking is that Apple only ever have a small number of products. This isn’t just about design; Tim Cook is absolutely cognizant that a functional organization cannot effectively manage too many products. It’s easy to ignore talk about P&L’s and performance incentives, but the truth is few things are more critical to how organizations are run. People do what they are incentivized to do; it follows that employees who are compensated based on the performance of their division are particularly motivated to ensure the success of the product they work on. That’s so bland as to be meaningless, which means the impact on Microsoft’s shift to a functional organization are profound: what is going to motivate employees working on a huge array of products whose contributions are so far removed from the all-up P&L? Again, the Apple counterexample: I wrote a few weeks ago that the latest Apple commercial – Designed in California – was written for Apple’s employees. This is why. Apple is uniquely reliant on non-monetary motivation; their employees genuinely believe they are making products that impact people’s lives. I doubt the same could be said for a random marketer on SQL Server. The flipside of motivation is accountability: the fact each product has its own P&L makes it very clear which division leaders are succeeding or failing. 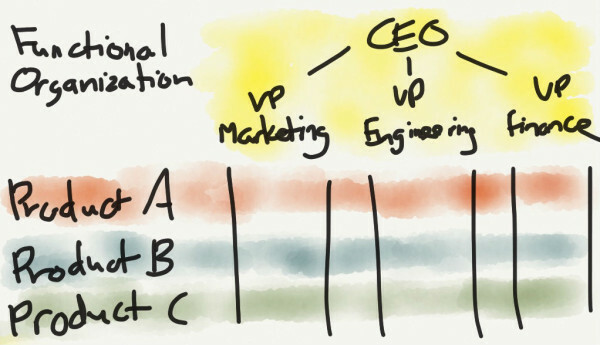 Things are much less clear in a functional organization. To go back to the DuPont example, when the business was failing fingers were originally pointed at Sales. It was only when the vice-president of sales successfully demonstrated that they were doing nothing wrong that the company searched for another root cause. Microsoft will face the exact same problem. Engineering will blame marketing who will blame finance who will blame engineering. This will absolutely be exacerbated by Microsoft’s internal culture, which steadfastly glosses over bad news and quietly ships out underperformers while throwing parties and praising their contributions. This is something Apple is very clear about, stressing the idea of accountability without responsibility – you may be dependent on others, but if you fail, it’s your fault. Thus Rob Schoeben was fired for MobileMe, Mark Papermaster was fired for the iPhone 4 antenna, and Richard Williamson was fired for Maps. I have not seen any evidence of the same sort of ruthlessness at Microsoft recently, even with the clarity of divisional P&Ls. I’ve already noted that divisional organizations favor generalists; generalists also tend to favor divisional organizations as there is a much clearer career path. You are able to move up not only within a specific function, but you can also move laterally amongst divisions, usually with a nice jump in responsibility. Microsoft has been hiring this type of person for years now: career-focused, monetarily-motivated generalists. In other words, the exact sort of person who does not do well in a functional organization that values expertise and experience. I interned at Apple as an MBA student, and while I had a fantastic experience, it was well-known that MBA’s typically did not last long at Apple due to the limited options for career advancement and the fact you were only ever hired for what you did previously, not for the broader expansion of skills you supposedly picked up in school. If Microsoft is truly committed to a functional organization they are likely going to face employee backlash, particularly on the business side. However, if this is indeed the goal, reorganizing the company to improve collaboration is like burning down your house to kill termites. It ignores the root cause and a much more effective solution. In my (very-biased) opinion, I believe collaboration is fundamentally broken at Microsoft. It is all about politics, not great outcomes, and that is absolute death in a functional organization, which has nothing but collaboration to hold together cross-functional product teams. At least in a divisional model all of the relevant team members have a common product and a common boss, meaning everyone has no choice but to work together. Unless the employee review and compensation model is significantly changed, this, along with the lack of mission and clear accountability, will grind progress to a halt. I harbor no ill will towards Microsoft. They were a great employer and I loved my team, annual reviews notwithstanding. However, the impetus behind this move seems sadly characteristic of many of Microsoft’s initiatives – great on the surface, not so great in the details. In this case, on the surface, functional organization are collaborative ones, and Microsoft needs to collaborate better. However, a closer examination as to why almost every organization of any significant size is divisionally organized suggests this may be Ballmer’s final folly.